This is a wonderfully bright and impressive delta wing (triangular) stunt kite. It takes just a few seconds to assemble and feels alive and responsive, even in quite modest winds. The rigid wing means you can fly at relatively large angles from the wind direction and this lets you make lovely swooping dives and spins. With a few minutes’ practice, we were able to make triple somersaults and recover before the kite hit the ground. The spine of the kite is held in place by a releasable tab that’s designed to reduce the impact force on the nose during a hard crash. We were never able to dive-bomb the kite hard enough for this to activate, but in higher winds, it should help protect your kite from damage. 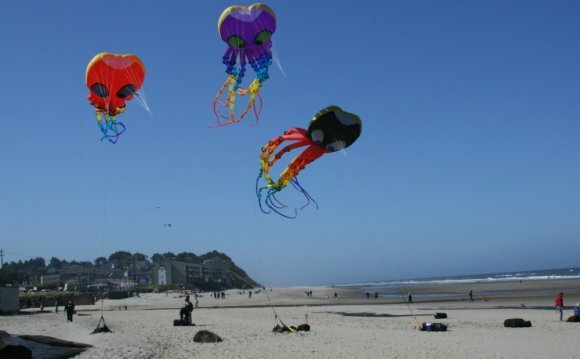 A rigid frame and high flying speeds make this kite a little more dangerous if you accidentally hit children or pets. The spars that support the leading edges of the delta wing don’t fold in half so the kite stows away into a bag that’s 1.1m long. That’s fine for the boot of the car, but not really practical for a rucksack. Since it uses a parasail-style wing, the Buzz folds away into a really small bag and there’s no assembly – you just shake it out and off you go. This makes it perfect for impatient children and the pull is light enough that even small kids can fly it quite easily. Crash landings are gentle and you can often relaunch it by yourself. Because it weighs almost nothing, the Buzz will get airborne on the lightest zephyr of wind and if the breeze suddenly drops, it will float gently down rather than thudding to the deck. Despite this, it’s very manoeuvrable and multiple somersaults are perfectly possible. What’s more, if you can hold it steady enough, the kite will climb higher and higher until it’s virtually overhead. The wing only stays inflated as long as there’s air blowing into the front. Fly too far to one side and the wing tends to collapse on the outer edge. It also seems more susceptible to low-level turbulence. This limits its flying window more than a delta wing. The Buzz flies more slowly as you perform stunts, making it slightly less of a crowd pleaser. This isn’t just a kite with a picture of a pirate ship on it – it’s an actual three-dimensional model with a hull, rigging and sails. This is guaranteed to draw gasps of admiration from everyone before you even get it in the air. Once it’s up, it flutters and darts like a corsair on the high seas. As a way to mark your territory on the beach, it’s hard to beat. In stronger winds, there’s a tail with three blue and purple streamers that you can attach to keep the kite stable, which even looks like the ship’s wake. How To Fly A Kite - Ever Had Trouble With A Single Line Kite? The best way to fly a kite?